Samsung's purported Galaxy Folder phone has appeared in the wild again, with a new series of leaked snaps and further word on potential specs. 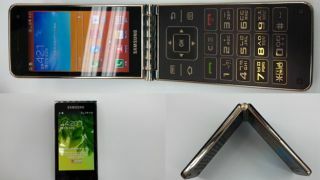 The unique handset will feature two 3.7-inch AMOLED 800 x 480 touchscreens according to Clien.net, with one screen on the inside of the clam shell design and one on the outside. The Folder will also boast a dual-core Snapdragon 400 1.7GHz processor and 2GHz of RAM according to the site, which falls in line with previous leaks of a Samsung user manual for the device. Beyond that, there's Android 4.2.2, a modest - by today's standards - 1820mAh battery and 4G LTE support. However, as we've seen this week with the Moto X launch, the era of specs being the be-all-end-all may be coming to an end. If the Samsung Galaxy Folder brings about the return of a once-loved mobile form factor and diversify the designs of modern smartphones, then the device could be welcomed with open arms. It may be academic anyway, because the device is only slated for a Korean launch at present. Is this the real deal? Check out this purported Galaxy Folder press shot.